It’s ridiculous how time consuming is to share a photo on social website like Facebook using iOS 5,with the exception of Twitter. On iOS 5 to share/post a photo to a social website — other than Twitter because iOS 5 has a tweet button — you need to download the application, you cannot do it from Safari or within the Photos.app. Apple added a photo sharing menu in iOS 6 which includes many social sites to add photos directly from the Photos.app, and made it seems like it’s the first mobile OS that allow you to share photos so easily. The new photo sharing menu is for iOS 6, but we don’t have iOS 6 yet. Apple even disabled that feature in iOS 6 beta. But fortunately, we have a great jailbreak community and we won’t have to wait until iOS 6 comes out this for fall to get this feature. We can now installed the iOS 6 photos sharing menu on any jailbroken device running iOS 5 thanks to a new Cydia tweak called iOS 6 Photos Menu. iOS 6 Photos Menu replace Photos menu with iOS 6 photos menu in iOS 5. 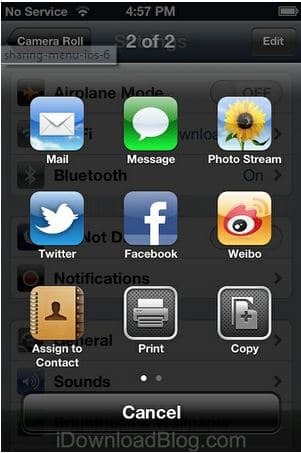 The tweak has Twitter, Facebook, and Google+ integration. iOS 6 Photos Menu also lets you assign photo to contact. 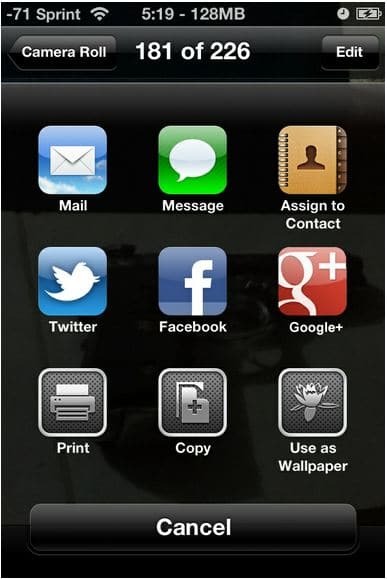 You can print, copy, and use the photo as wallpaper as well directly from the menu. You can download iOS 6 Photos Menu from Cydia from the BigBoss repository for free on any iOS device running iOS 5 or higher.